Originally a simple Pace Picante salsa recipe from the bottle. 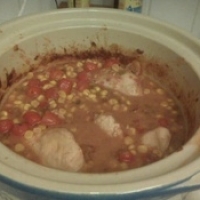 I added to it and made it into a crock pot meal that would cook while I was at work. Put all the ingredients into the crock pot. Mix it together a bit to dilute the sugar and stir in the mustard. Make sure the chicken is covered almost completely by the salsa and water. For a shorter time period, set it on high for 4-6 hours. For a longer cooking time, set on low for 8-10 hours. When done, check to make sure the chicken is cooked thoroughly and add more time if needed. Does your son like to eat this? Like Kekibird's recipes? Never miss an upload!